Following the Wilkes-Barre/Scranton Penguins' devastating Game 7 overtime loss at the Giant Center to end last season, Captain Tom Kostopoulos wasn't sure if it would be the last time he laced up the skates as a professional. He gave the same answer that he gave after each of the last two seasons ended, "I'm going to go home, talk to the family, see how the body feels and then we will make the best decision for the family." Maybe TK wasn't sure if he had another year in him, but his teammates and his Head Coach Clark Donatelli made it perfectly clear that they wanted their Captain back for another run at the only thing missing from his resume; The Calder Cup. Three weeks later when he signed another one-year AHL deal with WBS, everyone from the fans to the front office was thrilled to have #29 back for one more run. Why? Easy, every young player to put on the WBS sweater over the last 3 seasons credits Kostopoulos for teaching them how to act and play like professionals. He is the unquestioned leader on and off of the ice, and is the face of the franchise, owning just about every offensive team record in existence. Beyond the leadership role, at the age of 37 he had his most productive AHL season since the 04-05 campaign by notching 19 Goals, and 33 assists for a total of 52 Points. Maybe the most amazing fact about his outstanding season was that he added 12 Points in just 10 playoff games, playing his best hockey of the season when it mattered most. Did I mention that he played almost the entire season on a stress fracture in his foot suffered in November? Despite scattered reports that he might miss a bit of time due to the injury, he played the next night and no one heard about the foot again. That my friends, is leadership at it's finest. As someone who has watched Tom Kostopoulos play since the early 2000's, I cannot express just what a pleasure it has been. To watch him go out and lay his body on the line night after night, at the age of 37, is flat out inspiring. Imagine the energy his teammates must get from playing alongside him, if he can sacrifice for the team, then no one has an excuse. As long as TK is the Captain in Wilkes-Barre, the effort of this hockey team will never be questioned, he simply won't allow it. He defends his fellow penguins at all costs, he never waits for anyone else to send the message. This is his team, and he makes sure that no opponent takes a liberty without knowing that they will have to deal with him. He isn't a rah-rah guy, that's not his deal. 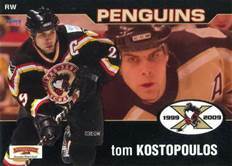 Tom Kostopoulos let's his actions and his play do the talking for him. So before this season gets underway I want to remind all Pens fans to appreciate the Captain. All great players are honored when there playing days are over, but I say let's honor him now, during what may very well be his swan song. While the expectations are once again high for WBS, and a Cup would be the best way to send #29 off into the sunset, show him what makes this town special, win or lose. 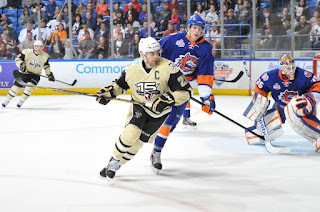 Tom Kostopoulos and the city of Wilkes-Barre have shared a special connection, it is rare for a professional hockey player to spend so much time in one minor league town. TK chose to come back here to finish his career, in doing so, he honored the city. Now it's Wilkes-Barre's turn to show just how much love they have for him. Here's to hoping for a special season for a special player. I first saw him play as a 13 year old fan and he earned my admiration after that first night back in 2001. Now at 28 and covering the team for Pens Initiative, I still enjoy watching him do his work, and admire him just the same. Probably More. Thanks to everyone for reading, I always appreciate the support! I will be covering WBS Training Camp daily beginning Oct.1 from Coal Street. Follow updates on twitter @jfoo1654 and @pensinitiative.